Small Business Site-Building Machine or Just Small? The average website builder isn’t much of a website builder at all. It’s really just a collection of templates and an avenue to posting said templates onto the web. For the average website maker, the average website template is plenty. But what if you want to step your game up a notch and actually use the Internet like the powerful tool that it is? Then you’re probably ready to graduate to something a little more advanced like Intuit, a sitebuilding service that targets small businesses who need not only a web presence, but an actual system of getting things done online. You’re not going to put up a four-page template for your business with Intuit; you’re going to employ marketing services, use online payroll, integrate your site with QuickBooks – basically, you’re going to feel like you own the web. That is, of course, only if Intuit lives up to its promises. Hence our dashing Intuit Sitebuilding review, where you’re about to get a glimpse of what Intuit can really can do. Who knows? By the end of the review, maybe you’ll be Intuit too. Intuit, being a step above your GoDaddy sitebuilders and broader in its ambition, deserves a review that judges it on its own intentions. Of course it’s better than a cookie-cutter website builder. But that’s not what we’re really going to talk about today: there’s too much else going on. Like many other good website building services, Intuit takes you right in by allowing you to set up the whole shebang on its site: you can register your domain, your e-mail addresses, upload your logos and do all that good stuff within a relatively short amount of time. It’s a great starting place for any small business that’s looking to enhance its web presence right off the bat. With the other integrations (as we’ll mention in the next section), the prospect of an instant branding is even more tantalizing. The templates themselves are actually surprisingly well-done. While they’re not going to threaten any freelance web designer’s job any time soon (as you can see at Intuit’s web design gallery, it’s certainly a cut above the low-grade website builders that essentially look like word documents exported to HTML. The templates are clean and professional, if nothing else, but what else do you really ask for? In other words, you can handle about a zillion different services that most businesses typically find a zillion different vendors for. In my book, buying all of these services from a single vendor is a major selling point, especially if you’re getting them all while saving money because the vendor likes to give you discounts. This alone makes Intuit a must-browse for any startup or small business that’s lost on the Internet. With the free thirty-day trials sprinkled around on Intuit’s site, you can even get started without negatively affecting your company’s probably-fragile bottom line. You can’t beat free services, so Intuit will at least be worth a good looking over no matter what you think your company’s Internet needs are. Of course, it’s easy to gloss over all of these services and get excited about the possibility of a site like Intuit working out; it blinds us to the possibility that the services aren’t all that great. And since we’re talking about the Intuit site-building machine here, we’ll have to delve a little deeper into the facts if we want to see if this is the service for you. 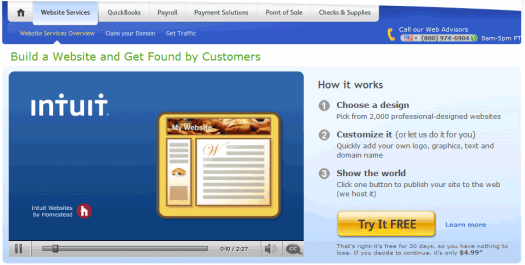 Building, Publishing, Promoting: Is Intuit.com Your Site of Choice? First, we have to look at the always-important variable: price. Pricing at Intuit is simple: it’s free! Well, free for thirty days. Sorry, I had to do that to you. After the thirty days are up, you’ll be on the line for about $4.99 a month for the basic website building and hosting package. Since the templates are good and you can easily integrate your site with Intuit’s other services, this is a pretty fair price. There aren’t any big-time marketing schemes to try to get you to pay for a longer period of time with a reduced per-month price, which always reeks more of an online dating service than a true-blue professional business-building service. Luckily Intuit has the good sense not to try to upsell its services ala GoDaddy.com. Besides, the thirty day free trial should be more than enough for you to consider using Intuit for your small business. Be careful, however, and set up an e-mail reminder for yourself so that you know when it’s time to make a decision about paying for another month’s worth of service. The templates are clean and professional and relatively inexpensive; so what about the other website building add-ons? You can, after all, register for your own domain and Intuit tells you to “show the world” what you’ve created. Well, for $4.99, you’re not exactly going to get the marketing capabilities of Nike, but that’s to be expected. You’re paying for a web presence here – the rest of your company’s success will be up to you. Intuit is professional, easy-to-use, and is simply an exciting service. I highly recommend Intuit for anyone who’s starting out a small business and wants a quick way to build something that’s capable of actually running like a business. It’s not enough to find a website builder that publishes your words; you need something that hooks up to your business like an actual tool of business. Intuit delivers the goods. I am starting an internet business and I’m looking for a good web presence and an interface that is very user friendly, but I’m not a techie kind of guy, I just need a website that makes me look like I’m an expert. Can intuit do that for me? Lanie, I know Intuit got a good review but I would look at some of the other options like Squarespace or even Wix which are reviewed here. Better yet, get some good low cost hosting and a theme and go with a wordpress.org solution.